I first went to Bumbles about three years ago and remembered it for having really good food at very reasonable prices. In fact the food was so good for what I paid that I was pleasantly surprised. I discovered the restaurant purely by chance, through a friend who worked in Victoria where it’s located. It seems to the sort of place that hovers low on the publicity radar, but is well liked by locals and those in the know. Case in point – it was absolutely packed on the night of our visit. So how did visit number two fare? Overall it was resoundingly excellent. The restaurant offers an `a la carte menu from which you can also choose three courses for £20. This works out cheaper than ordering those dishes individually, although certain items incur a supplement. There is also a cheaper limited option 3 course menu on offer for £10. We chose 3 courses from both the `a la carte and the £10 set menu so I will cover the dishes that we had from the `a la carte menu first, listing the `a la carte price of each of those dishes as I go along. To start, an omelette Arnold Bennett with smoked haddock (£5.95) was superb. 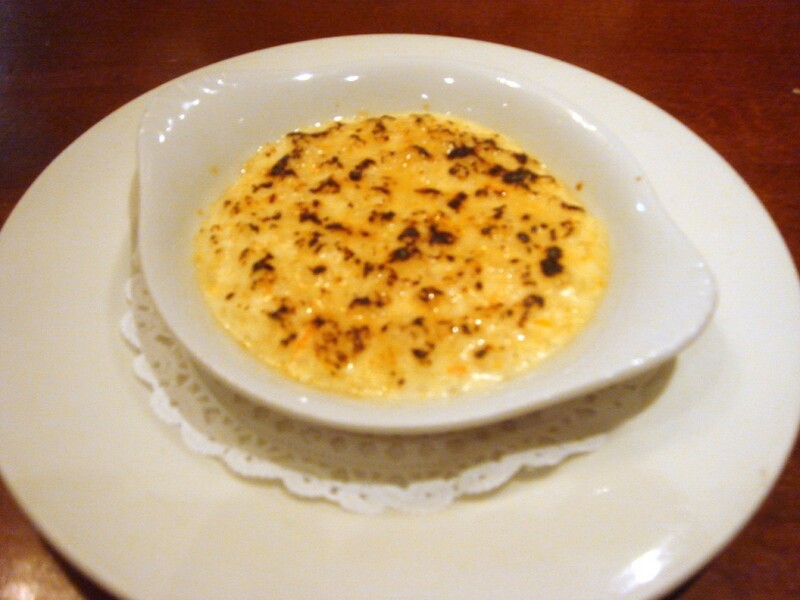 Made with a combination of gruyere, parmesan and cheddar cheese, the omelette was creamy, luscious and rich. 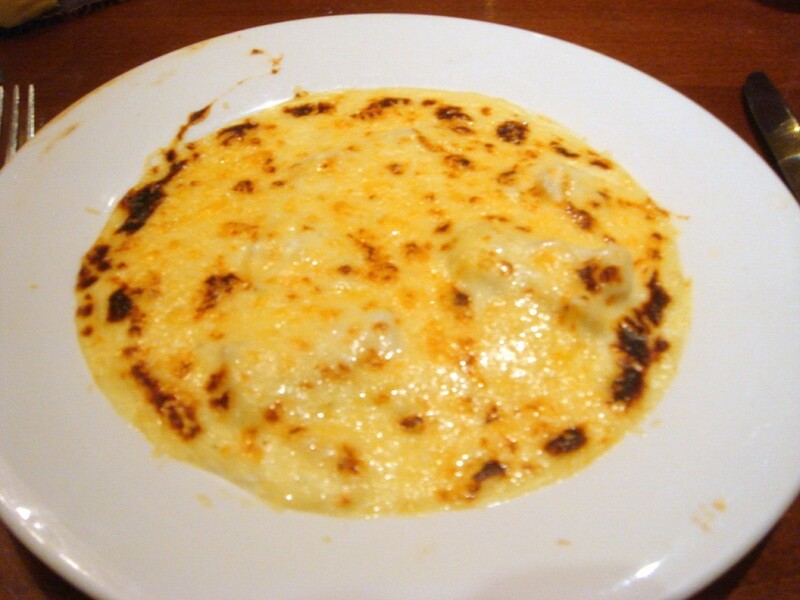 There was a beautiful balance between the cheeses and the haddock was firm and tasty. This dish was plate-licking good although more care could have been taken in cleaning the rim of the plate before presenting it. Before being served our mains, we were presented with a taster of homemade tomato soup. Hot and rustic with a deep tomato flavour, it was a nice touch by the restaurant. A main of breast of Yorkshire wood pigeon, served medium rare, was gamey, flavoursome and tender (£13.95). However, the rest of the dish was a little too busy. The pigeon was accompanied by bacon, cabbage, black olives, lentils, diced apples and red wine sauce, and the variety of flavours from the various ingredients didn’t quite gel together. The red wine sauce was nice, but could have done with further reduction. 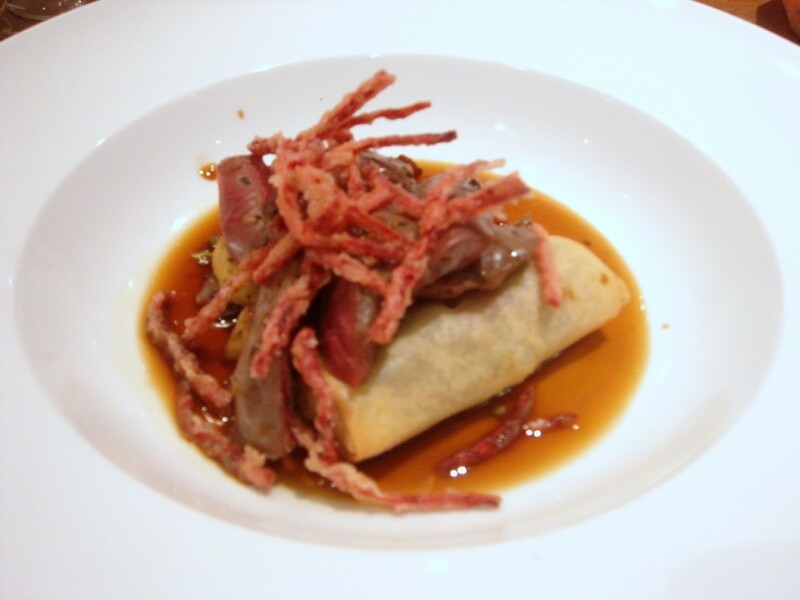 There was also a braised leg of pigeon in a filo roll which was pleasant, but the pastry was a little too thick, as if it had been rolled a few too many times. Overall this was a decent dish, but not outstanding. A bread and butter pudding soufflé with custard ice cream was excellent (£5). The soufflé was light and fluffy and not too eggy. The custard ice cream worked well with the dessert, adding a touch of decadence to it. 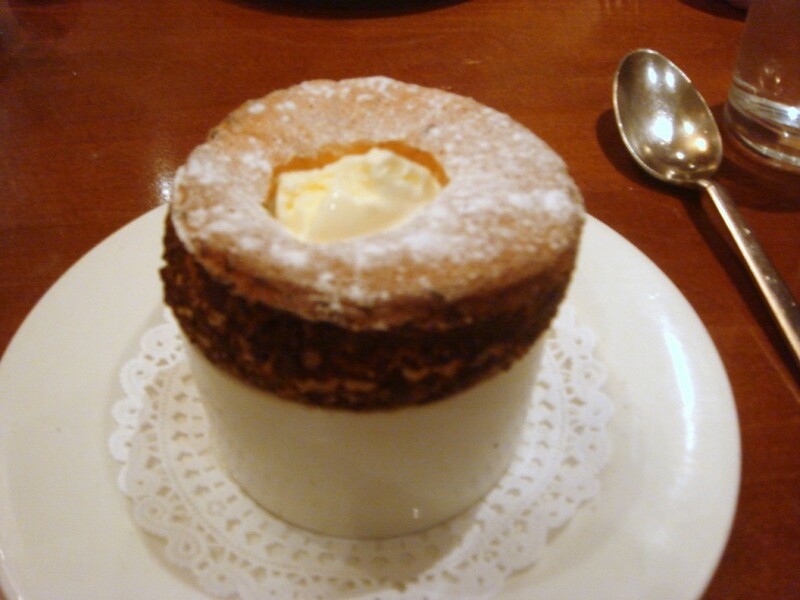 The ramekin had also been coated with shavings of chocolate, and so you got nice bursts of chocolate when eating this lovely soufflé. 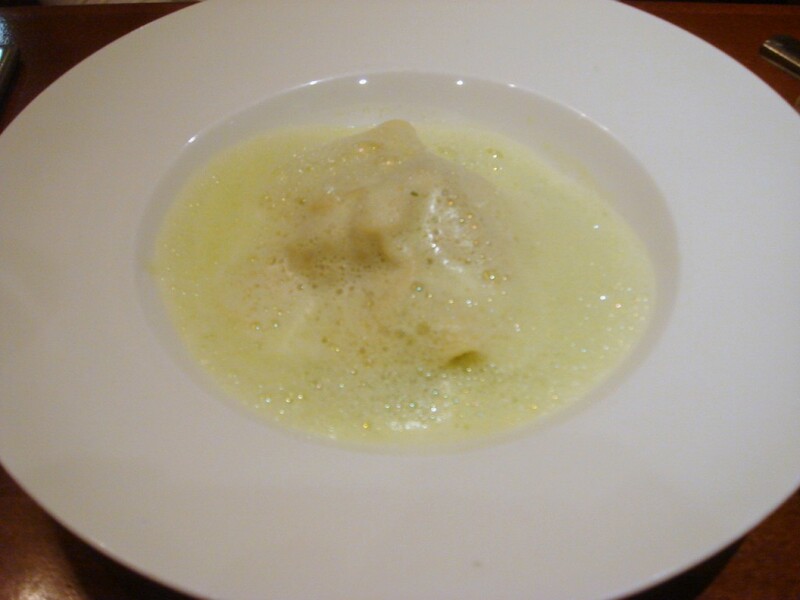 To the £10 menu, and a starter of ravioli of Devonshire lamb sweetbreads with pea cappuccino was pleasant, but unremarkable. The sweetbreads were rich in flavour, but the pasta was a little overdone, and the pea cappuccino was slightly runny and could have done with further reduction. Still, this dish was tasty enough given that it was part of a £10 menu. 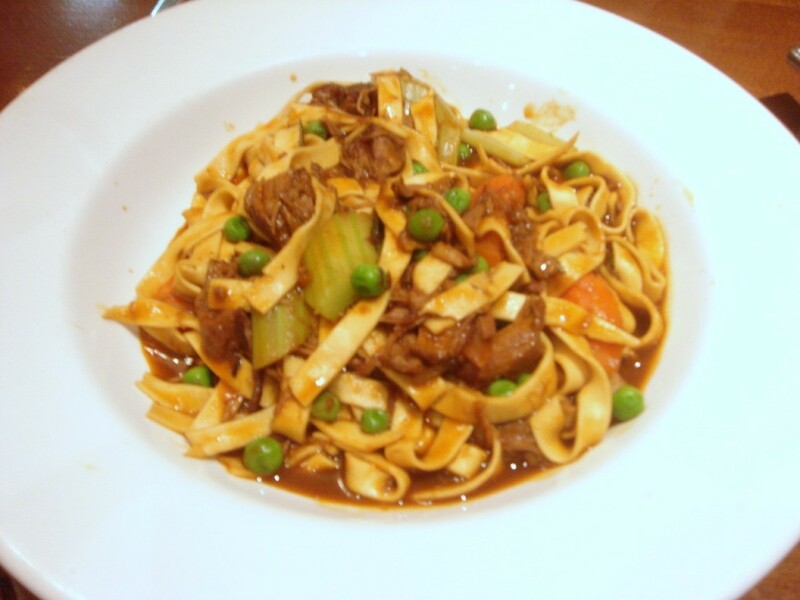 A main of tagliatelle of slow braised Devonshire lamb was also pleasant but unspectacular. The lamb was tender and soft, but I would have preferred a richer, deeper ragu flavour in the sauce and the pasta to be more al dente. However the portion size was extremely generous and very good value. A Grand Marnier rice pudding (with a £1 supplement) was tasty and creamy, although it was difficult to identify the Grand Marnier in the pudding, with the exception of the hint of orange. This meal did not disappoint, and in light of what we paid, it reaffirmed my belief that Bumbles is one of the best value restaurants in London. The £10 menu wasn’t as good as the `a la carte menu. But that aside, the food served as part of this menu was pretty decent and the portions were generous. So for people looking for value for money, this menu is hard to beat. Personally, I would go to Bumbles again and choose only from the `a la carte menu, as the quality of cooking is noticeably better and the menu only costs £10 more. Admittedly the pigeon, while really good, did not match the excellence of the omelette or the soufflé. But these two dishes were so good it was hard not to be impressed. On reflection, the omelette was so filling that I would have happily had that and the soufflé, skipped the main, and still left the restaurant feeling very full and satisfied. And it would have only cost the bargain basement price of £11. The service is high on smiles and attentiveness, and the restaurant does a nice job on the décor which is homey and warm with its maroon walls and wooden floors. Furthermore, the crowded restaurant also ensures a buzzy ambience. Bumbles is not a high end gourmet destination, but when you consider the prices they charge for a central London location, its great food and fantastic atmosphere, then it’s hard to consider it as anything but a little gem. Listed above and does not include service or drinks. I like the artwork of the map upstairs, by the former Polish employee, there.